“A Higher Level of Service” – what does that mean to us? Our mission is to be the plumbing company you can trust to provide a higher level of service. Our family will treat you with respect and honesty. You can depend on our teamwork to solve your plumbing issue and communicate with you through the entire process while appreciating and valuing your time. With fun and integrity, we will educate you so you can make informed decisions regarding your plumbing repair. Our team’s dedication to continued personal and professional growth will serve our clients long-term, creating a loyal community of clients that become family. When we started Robins Plumbing back in 2004 it was because we had a vision to lead the plumbing profession and raise the bar on service by adding what seemed like common sense to us – TRUST. You can trust Robins Plumbing to do the right thing we base all of our decisions on what would be the trustworthy choice, how would we want our family and friends treated? One of our plumbers brought this value to our company culture. He expressed that he feels like he has a family here at Robins Plumbing and it was incredibly important to him. He felt like Team Player just didn’t truly convey the culture that we have and that the word family was the only word that could truly express how excepted and supported he felt in this environment. He pointed out that we treat our clients like family, our vendors like family and of course our team of technicians and support staff. We promise to be the plumbing company that treats you as part of the family. Respect starts with us. Our team members are encouraged to communicate and grow together and to have an understanding of what each members’ purpose and vision are. We can better respect each other when we understand each other better. Whether it is a new laborer in the field to the President of the company, respect is a vital part of our culture built through teamwork, education, and honesty. You can trust the team members of Robins Plumbing to be honest with you. We pride ourselves on being truthful with each other and with our clients without honesty there can be no trust. You can rest assured that the team of Robins Plumbing will never try to sell you things that you don’t need you can count on Robins Plumbing to be honest with you about the plumbing services that you do need and that are important to your home or business. Dependability is incredibly important, not just for our clients but for us as team members. As a team, each one of us depends on another and our clients depend on us as well. You can depend on us to be there and you can depend on us to communicate and to provide incredible service at a great value. Teamwork makes the dream work. When we think of team work we think “All for one and one for all” Everyone at Robins Plumbing plays an integral and important role in the success of our company. Each team member knows that they bring incredible value and expertise to the company and to our clients no job is more important than another, because like a puzzle, it takes all different pieces to complete the picture. One team members’ success and growth is all team members’ success and growth. We believe that true value comes from appreciation, appreciation for our team members, our clients and the difference that we make in our community. We show appreciation as part of our company culture, from thank you cards to our new clients, thank you cards for those amazing clients that refer us, our loyalty program that expresses appreciation to our clients for their loyalty and trust. Our team members every day also express appreciation for each other as each of us demonstrates and is acknowledged for leading with our company values. The words THANK YOU are very powerful! We love to have fun, we take pride in our profession and skill but who doesn’t want to have fun while they work? We have a very fun atmosphere at Robins Plumbing where jokes are a part of our daily routine and so is laughter. We love singing in the office to get tunes stuck in each other’s heads and playing fetch with the dogs in between phone calls. Our team loves to go on new adventures every month like learning how to paint, pottery, and golf with the occasional fancy champagne brunch in between. Integrity for Robins Plumbing is clearly defined as doing the right thing when no one is watching. It is one thing to do the right thing when you have an audience it is another to do the right thing when no one but you will ever know about it. We have a firm foundation built on integrity and our reputation as a company that can be trusted is built on doing the right thing even when no one knows. Weekly at Robins Plumbing we have a meeting and cover product education as well as leadership skills and team building skills. Robins Plumbing is constantly striving to learn and increase our skills so that we can share that knowledge with our clients. Our team members love to educate our clients so that they can make informed decisions for their homes and businesses. Our team members educate each other with new products, new ideas, and the best way to handle different situations in the field. At Robins Plumbing we are passionate about growth. Growth in our team members and growth for our team members. Personal growth and self-development are a part of our culture. Investing in our team members, who are our greatest asset, helps to create an atmosphere of learning, fun, and team work. We love creating new opportunities for our team members through education and growth. 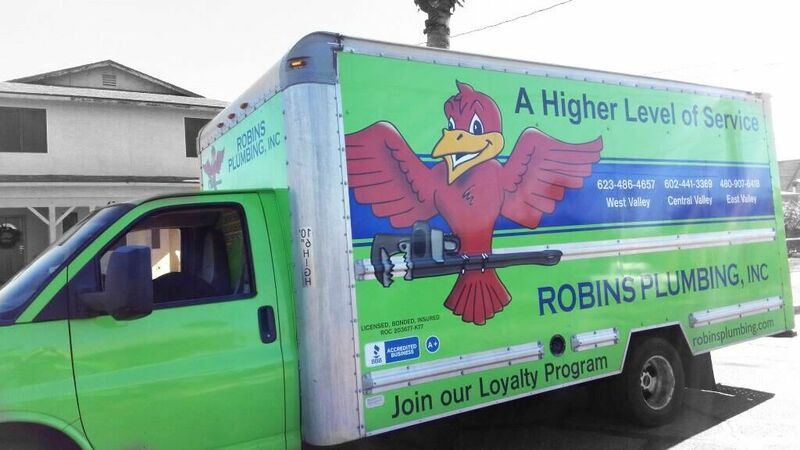 Loyalty is incredibly important to Robins Plumbing, loyalty to both our clients and to each other as a team. Trust and loyalty cannot be bought, they have to be earned and each day we strive to earn the loyalty and respect of our clients and our team members.